The Nabji Trail is an ideal post-harvest/winter trekking set out in Jigme Singye Wangchuck National Park, a park with an ecological rich environment. The park, located in central Bhutan, is also home to several cultural rich agricultural villages. The trail is a six-day low-altitude trek (between 693m/23100ft and 1,636m/5453ft) through six different villages located inside the park. Starting point Riotala (1060m/3533ft) and final destination Tongtongphey (1061m/3537ft) are two small villages along the Trongsa-Zhemgang road, situated in the buffer area of the park at the east side of the Mangde Chhu (river). 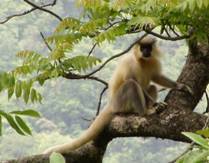 On this trek, you will possibly see the Golden Langur (Trachypithecus geei), one of the rarest primates, which can only be found in Bhutan and neighbouring Assam. Jigme Singye Wangchuck National Park is also home to the endangered Rufous-necked Hornbill (Aceros nepalensis). More so, the trail is a superb place for birding (common mynas, blue-fronted redstarts, long-tailed shrikes and Eurasian sparrows, to name just a few common species, but spotted are also serpent eagle, golden-throated barbet, and the yellow-bellied flowerpecker) and has a wide variety of plants and flowers found in this Himalayan area (from Chir Pine, broad-leaved trees and Bamboo, to Rhododendrons and wild Orchids). Besides the natural beauty of the area, the area also contains cultural history, witnessed among others by the presence of a commemorative pillar in the temple of Nabji. The pillar symbolises the occasion that peace was negotiated between the two kings (King Nauche from India and King Sindu from Bhutan) intermediated by Guru Rimpoche in the eight century. Along the six day trail more traces of Guru Rimpoche’s presence during those days can be found. The last two days of the trek will go through the homeland of the Monpa people. 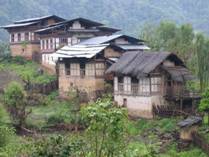 The small traditional villages of the Monpa community are scattered on the slope overlooking Mangde Chhu. The Monpas are thought to be the first settlers in Bhutan, the Mangde Chhu valley representing one of the earliest areas of settlement in Bhutan. The Monpas practice a mix of animistic shamanism and Buddhism. Monpa refers to “the people of darkness” referring to their isolated position in the past. In general term Mon refers to people without religion that symbolises period before the advent of Buddhism in Bhutan. They were originally hunters and food gatherers and their culture, tradition and practices are intrinsically linked to the forest around them. They are traditionally cane weavers and bamboo crafters, using their skills for house construction, making baskets and other household items. The Nabji Trail supports the park management in their efforts to conserve nature by creating more awareness on natural and environmental issues, through tourism awareness programmes and by introducing socio-economic benefits out of tourism. Specific measures are put in place to maximise socio-economic benefits and minimize negative impacts from tourism development to support the livelihood of the local community in the area and to create more awareness on natural, environmental, and cultural issues. The trail itself has been in use since long by the villagers themselves, who use the trail to commute between villages. A waste management system has been put in place where tour groups have to carry their non-degradable waste out of the park. Waste can be disposed of at the end of the trail, at the Park Range Office in Tongtongfey, where an incinerator is build. This incinerator is not only for the benefit of tour groups but also the local community. The trail has been developed in such a way that community will have the sole responsibility to manage and provide services. The service package includes community camping sites with basic facilities (Nimshong, Korphu, Kubdra and Jangbi) or with bucket shower/hot stone bath facilities (Nabji), local lunches, tea or meal. The rates for these services are standardised to avoid misunderstanding between communities and the tour operators and tour groups. Each village has a Tourism Management Committee (TMC), as appointed by the villagers. The TMC will monitor and control the services, revenue collection and utilization through the Community Development Fund (CDF). The revenue so generated will go directly into CDF bank account. On rotation basis, individuals from different villages generate income through portering from village to village, assisting as cook, or village guide. Other activities generating income for individuals by developing tourism in JSWNP include cultural performances, sales of crafts, vegetables and other agricultural products. The TMC decides the deposit on certain percentage of the revenue generated from the individual tourism activities such as portering, guiding and cooking into the CDF bank account. The accumulated fund can be used by the communities for their village development activities, children education and expansion, conservation activities and maintenance of the tourism related infrastructure. The fund can be used to support initiatives which involve those who are not directly involved in tourism development (especially children and elderly). The Nabji Trail was officially opened on 20th November 2006. Best time to visit the area is from October to March and bookings can be made through a Bhutanese tour operator. A maximum number of 11 people per tour group are allowed on the trek (incl. the FTO tour guide if any). The community will offer a service package that includes campsite, porters, village guides and cooks. Others services and products offered are cultural programs, handicraft made out of cane and bamboo, vegetables and firewood. All campsites have more or less the same basic facilities such as camping ground, toilets, kitchen and a mini theatre for dining purposes and cultural performances, only Nabji campsite will have the option for hot stone bath. The trail’s start and end is located at the road between Trongsa and Zhemgang. Therefore Trongsa is a good ‘base camp’ to start the trek. Not only because of its close distance from start and finish of the trail, its accommodation facilities, and its perfect location between Punakha and Bumthang, but also because of possible visits to Trongsa Dzong and its Ta Dzong (a watch tower which will be converted into museum). Kuenga Rabten, the old winter palace, can be visited along the way to or from the park. After furnishing yourself with ample information about the trek from the information booth at the Park Range office in Tongtongfey, the Jangbi village guide steers you down to the Mangdi river where you cross a suspension bridge. The first day brings you in contact with the Monpas who are believed to be the first inhabitants of Bhutan. A glimpse on their lifestyle further validates their ethnicity, coupled by mythical legends about their origins. The campsite in Jangbi stands on the valley sill, which offers a resplendent view of the Mangdi valley. The morning allows you to further interact with the Monpas. Before you proceed, you could pay a visit to the orchid garden till your thirst for botanical photography gets satiated. The hike to Kudra provides a nuance of jovial atmosphere because this part of the trail meanders along stone imprints of Guru Rinpoche’s footprints, dagger and phallus, festooned by stories that espouse Guru’s praxis. Lunch is served just before you reach Ugyendra, a steep cliff below Phrumzur, one of the few villages of the Monpa communities scattered around the trail. With renewed energy from lunch, you could visit the village lhakhang and then proceed to the campsite in Kudra. You wake up with the distant call of the Rufous-necked hornbill. This part of the trek is a collage of streams, waterfalls and thick forests that will give you an invigorating feeling of being out in the wild. The Great Himalayan Squirrel, Rhesus Mecaques, and small snakes are often spotted along the trail. Unseen but present, are Himalayan black bear, Red pandas, tigers, Clouded leopards and many more. Upon arrival at the holy tree in Nabji, the people will give you a heartwarming reception. Nabji is a beautiful village with endless paddy fields demarcating the valley and surrounding the campsite. En route to Korphu, the Nabji temple is located in the middle of the paddy fields. Inside, there remains a stone pillar on which Guru Rinpoche, while traveling through Bhutan in the 8th century, brought consensus between two warring kings: King sindha Gyelp of Bumthang, and King Noeche, by imprinting their thumbs on each side of the stone. Korphu is situated on a mountaintop at an altitude of 1,500m. The most striking thing about Korphu is that the people exemplify hospitality almost treating you like ‘A King on accession to throne’. You have the option of being welcomed with a traditional ‘Chipdrel’ procession and a ‘Marchang’ ceremony, singing traditional songs of praise and wellbeing for new visitors. They also perform the traditional ‘Tashi Labey’ dance to bid you farewell. If you are interested, you can participate in the quintessential Bhutanese games of ‘Khuru’, ‘Dego’, ‘Sok-sum’, and ‘Gee-dum’, all on the brink of disappearance. You could also pay a visit to the village temple that houses the sacred relics of Pema Lingpa, the famous ‘Treasure revealer’ of Bhutan. The village campsite provides a spectacular bird’s-eye view of Nabji and surrounding areas. The hike from Korphu to Nyimshong is pleasant and arguably the best birding spot which can boast a bird list of more than 395 species, with among others the elusive Rufous Necked Hornbill who has its nesting holes adjacent to the trail. The walk is mixed with waterfalls and, streams and cantilever bridges. The evening brings you to Nyimshong, a village with its reticent architecture and lifestyle. The women of Nyimshong have a penchant for singing and dancing and a cultural show would be ideal to express certain euphoria to end your trek. Of course this is optional. If you are lucky, the Golden langurs will lead you to the exit. Your descend down to the Mangdi river again to see some herons and River-lapwings. An hour’s steep ascend to the road and your driver will drive you back to Trongsa.